to raise money for DC Central Kitchen and Martha's Table. 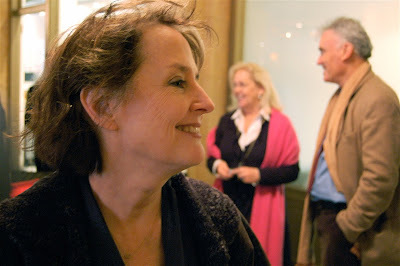 I have to admit, I got a wee bit giddy when I got to shake hands and chat with Alice Waters this morning at Potenza. For a food writer (not to mention the daughter of organic food-loving hippie parents), it was a treat to meet the local food pioneer. Fresh off a tour of the White House kitchen and gardens, Waters and a group of visiting chefs met up at Potenza this morning for a breakfast of truffled eggs, sweet grape focaccia and blood orange juice. The gathering capped off last night's Sunday Night Suppers, 14 dinners at homes around the area that raised big bucks for DC Central Kitchen and Martha's Table. 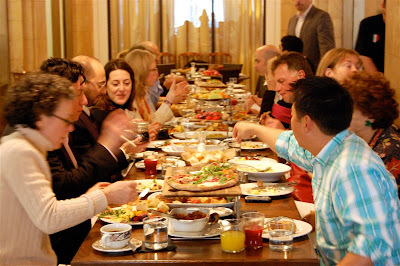 Guest chefs and organizers of Sunday Night Suppers dig into breakfast at Potenza. The visiting chefs, who included the Slanted Door's Charles Phan and the Modern's Gabriel Kreuther, joined the hometown talent — Cathal Armstrong, Michel Richard, Brian McBride and Tony Conte, just to name a few — to prepare Sunday's meals. Waters didn't stay long this morning, but she did make it clear how impressed she was by both DCCK and Martha's Table. "I find talking to them very inspiring," she said. "It's so wonderful to see a huge organization like [DCCK] talking about the most innovative ways to use organic food." The Chez Panisse founder also said she'd like the Sunday Night Suppers to be an annual occurrence.